I’m not going to be home Sunday but I’m going to try to set this post up early and have it automatically post on Sunday. Let’s see if it works! I won’t be able to add it to the Sunday Sketches Mr. Linky until evening, but at least I’ll have posted. I don’t like to miss SS. 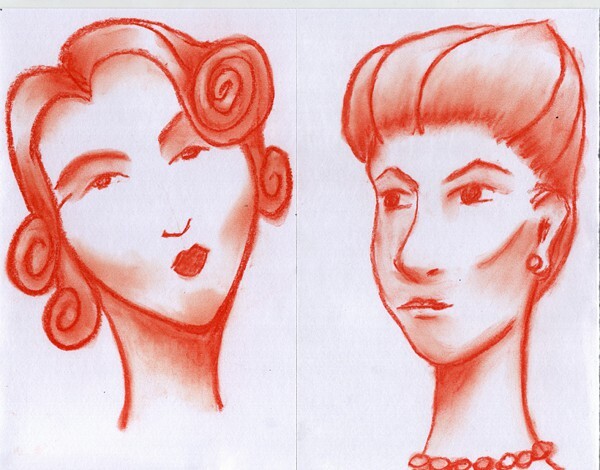 These are just a few of the 101 faces I drew this week for Carla Sonheim’s Faces 101! Summer Camp. These were part of Fridays assignmet. 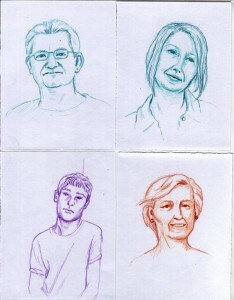 Tiny colored pencil sketches from photos, 4 1/4″ x 5 1/2″ and Stylized drawings with conte’ and charcoal. I found it difficult to work so tiny with the colored pencils and could have gotten a better likeness with a larger size. The stylized ones were quick and fun, though. I never enjoyed summer camp this much as a kid. This entry was posted in Arts & Crafts and tagged portrait, scribbles, sketches on August 14, 2011 by admin. What fantastic faces! And I love the conte ones. Your portraits from pictures are awesome (super awesome)! cool stylized ones too! Wow..all are beautiful and fabulous…wonderful expressive work…love it!! Well it sure looks like you’re having fun. That’s a lot of faces to draw! FABULOUS!!!!! I want to go to camp with you!!! You are doing some amazing work, here – nice job on all of the faces. ! Lucky you – I am so glad you joined us today! Your post worked – I have not done an automatic post yet, need to try that!! Have a great Sunday! WOW! Let’s face it this is one awesome summer camp and you must be the star pupil! Lovely work! they look great to me. I think working in small size really keeps you from making mistakes. but that’s just me. 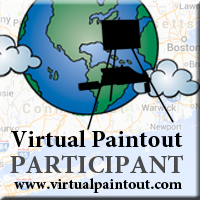 This is such a cool project you’ve got going. That is a challenging size for a portrait. Great job! Nice sketches! I really like the bottom one, with the curly hair. Wow, 101 faces – what an undertaking!! My favorite is the stylized one on the left with the neat swirly hair. It is so easy to see your talent even in quick sketches. So nice to meet you! I enjoyed looking at all your creatures, faces and paintings. Really lovely.